The final product, ready to grind into a fine powder; I use a Krups grinder as well as this Japanese mortar. about 60 hours total (between smoking and drying). 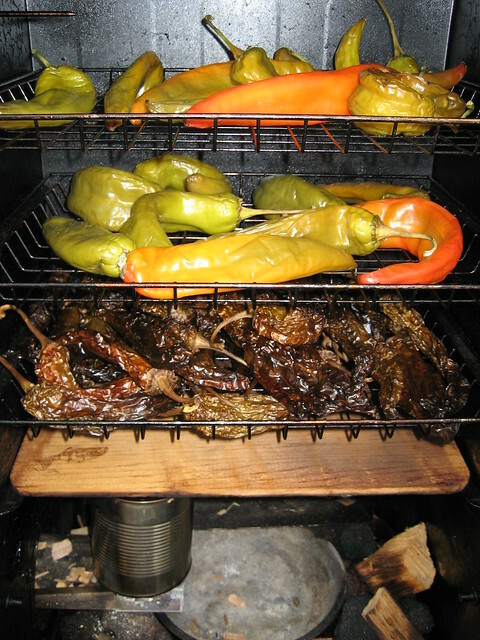 A second batch of Hatch green chiles sits above another batch that is nearly done. I have spent the last several days making a about 2 pounds of hand smoked Hatch green chiles. I started out with about 15 pounds of fresh chiles and smoked them at about 150° for a total of about 72 hours until the chiles turned a dark golden color and were completely dried. This is the first time that I have smoked chiles and I am very pleased with the result that I have achieved. The process was certainly time consuming - but the ultimate results are well worth the wait. 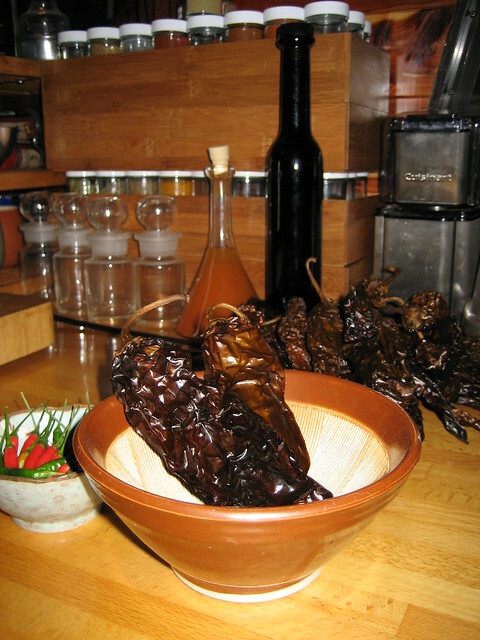 Chipotle chiles (smoked Jalapenos) are the most common smoked chile - - though morita chiles are also a commonly smoked chile. I have not personally had any smoked Hatch chiles - either red or green (chipotle chiles are made from red japapenos), but I can say now that there is no reason not to smoke them. The flavor of the finished chiles was surprising even to me. After the extended smoking, I let the chiles sit in a loose canvas bag for several days and "air out". The chiles have a strong smoke aroma that is followed with a wonderful sweet chile sent that is unmistakable. 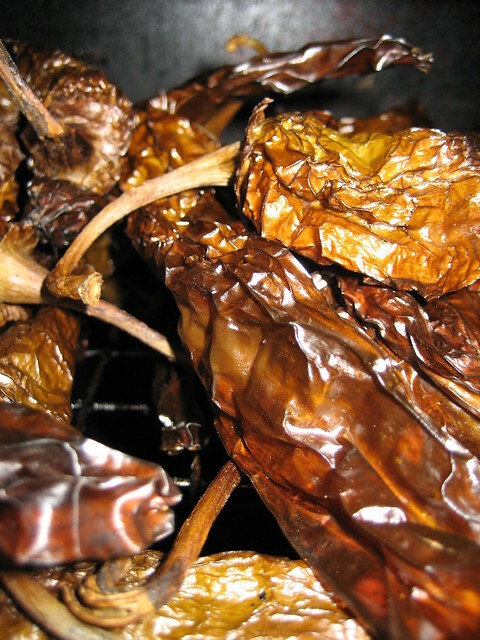 The chiles smoked from green to a light reddish orange when fresh to a wonderful golden color that ranges from a light yellow to a darker golden brown. The flavor of these chiles is fantastic - the smoke is right up front but not bitter of over done - I was considering cutting these chiles open to shorten the drying time of the chiles and I am very glad that I did not - yes the chiles took MUCH longer to smoke and dry, however I strongly suspect that had I cut the chiles open that the smoke flavor would have been overpowering but the finished product was just perfect. I used these chiles for the first time the other night to make the red chile listed below. The same chile sauce could be made with chipotle powder though it would likely be much hotter than it turned out with smoked hatch chiles. To overcome this issue you could swap out some of the New Mexico Chimayo chile for a smoked paprika for a good - and less spicy version that tastes similar to the recipe using smoked green Hatch chiles. I smoked the chiles with pecan and mesquite woods - skipping the Bradley biscuits and instead using my two can hack on the Bradley's smoke generator. 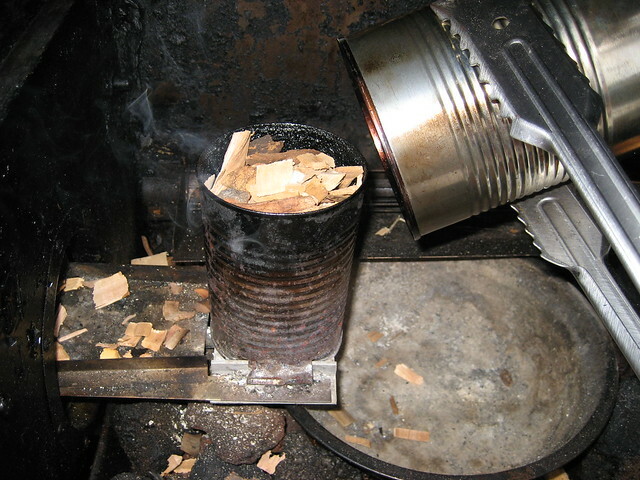 This is a very useful addition to the Bradley that makes for a much more versatile smoker - the Bradley biscuits are great for some applications, but I find that ordering my wood from Bradley leads to my not having the wood I need when I want it. The two can hack allows me to use any kind of wood I would like (small chips work best) and I can purchase it from local stores. The downside is that I have tend the smoker more often (roughly once an hour), but I prefer the finished product as well - as I find that I can better control my heat and smoke production using the two can hack, while still getting the advantages of the "cool smoke" that is a unique trait of the Bradley line of smokers. When it comes to grilling fish, the Japanese have mastered the art. Which should hardly be surprising, when at least according to the Guardian "one in ten fish is eaten in Japan. " As a culture Japan has explored the eating of fish to levels quite literally never even thought of yet in the west. We have plenty of sushi bars in the States, but the food served at most American sushi bars is a very narrow range of possible selections you could make of Japanese fish dishes. 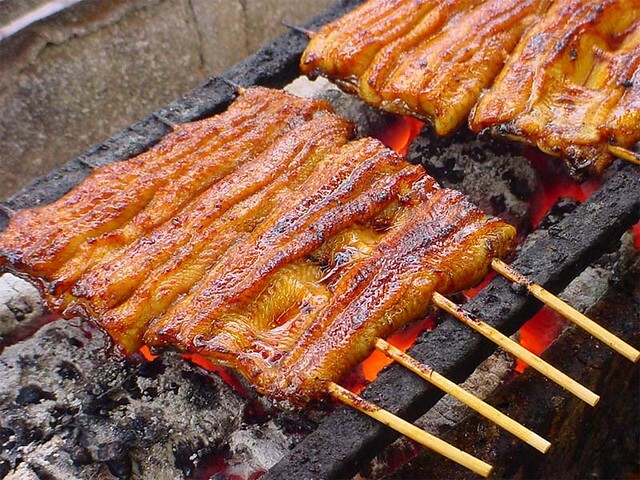 The cooking process is what makes the eel both crisp and tender: The eel is first grilled over hot oak charcoal, then steamed to remove excess fat, then seasoned with a sweet barbecue like sauce and grilled a second time. The first installment of a two part series on smoking salt. See the link at the bottom of the page to Experiments in Smoking Salt: Part II. Chilefire also hosts a Salt Smoking Discusion. Please Join us! The alchemists believed naturally occurring dew contained the divine salt or "thoughts of the One Mind". Dew was likened to Gods sweat, so to tease salt from it would give you quite a condiment indeed. 2 hours of smoke & these crystals are beginning to color a slight amber with deep smoke aroma. I am surrounded by wisps of the sweet smoke of orange and mesquite woods, it is a windy spring night aboard the boat, blustery, with a slight chill that is unique to spring on the water. Tonight the smoke from the onboard cooker adds gravity to the evening, seemingly weighing down the passage of time. Salt is fascinating. Like water, salt is an absolute essential, without it ultimately we will die; and yet natures only guarantee that we seek it out is our "taste" for it. Unlike water, food or air, our bodies do not symptomatically crave it. We go without ever craving it until we become ill, and ultimately die. This basic relationship we have with salt has created an incredible and epic history. Politics, religion, science, human history is as intimately intertwined with salt as our biology; and culture is full of hidden references to salt that we take for granted in today's relatively salt rich world. Roman soldiers were paid at least partly in salt, it was their salarium, or 'worth in salt'. The tradition of paying soldiers in salt is not at all unusual, It is said to be from this that we get the word soldier - 'sal dare', meaning to give salt. In many times and places around the world salt has been used as currency. In Latin, salt is Sal which is the root for many familiar words, including Salary, Sale, and even Salvation. The Bible makes a number of references to salt, and generally held it to be incorruptible - thus a covenant of salt is one that can not be broken [2 Chronicles 13:5]. (1) Salt is strongly symbolic in Judaism and Islam as well and appears equally in eastern religions. This is illustrated by a story in the Hindu "Chandogya Upanisad" which is one of the oldest and largest works of Hindu mystical teachings. “A boy at the age of 12 years left his family to learn from a school. On returning at the age of 24, the young man's father realized that his son had learned the scriptures without understanding the nature of Brahman. He therefore asked his son to sprinkle some salt in a glass of water. The next day the father asked his son to find the salt in the water. As the salt had dissolved, the search proved to be futile. The father asked his son to taste the water from the top, middle and bottom of the glass and asked him how it had tasted. The son replied salty and the father asked where is the salt the son replied he could not see the salt. His father replied that just in the same way you cannot see the spirit, the Brahman, which encompasses the universe but it is there. That is the reality, that is the truth and you are that truth”. Salt was used symbolically in a very similar way in the middle East and West in the traditions of alchemy. Alchemy, in it's most common and romanticized understanding is of course, the pseudo-science of "transmutation", of changing of lead into gold. Alchemy however was also the foundation of what led ultimately to what has become modern Western science. I have scoured the web looking for information on smoking salt but thus far I have been unable to find anything of interest or utility. Smoked salts are beginning to appear on shop shelves however, being offered by 4 or 5 different salt crafter's. Rather than pay the $15.00 an ounce that Whole Foods was asking, I decided to try to make it myself. What I have come to find is that smoking salt is something of an art. While I have many many times cooked with salt, this last week has been the first time I have cooked salt, and my first experiments have been of mixed results. My very first try I smoked kosher salt for about two hours in a hot ( 225° +) smoker, with a pan of water, orange wood chips following the smoking of a rack of lamb. We didn't try the salt until the next day , and when we did, it was amazing! The smoked salt brought a really pure smoke flavor to whatever it was sprinkled on. I have spent the last several days trying to reproduce the same thing again, with significantly less luck. I am not sure what it was that I did right that first time, but I have been unable to reproduce the effects, so I am going to get more systematic going forward. I received neary 7 pounds of salt in the mail today, just over a pound and a half of Maldon sea salt, and about 5 pounds of Himalayan pink salt. I am planning on working a series of small batches until I have mastered it and I will post the results and the methods I find successful here. My goal is to create a series of finishing salts from different woods. My first experience with smoked salt suggested that salt is a unique carrier of the smoke flavor, and I would like to make a set of jars, each containing a sample of salt from a different wood, hickory and mesquite are what I am working with until I have a system down; alder, orange, cherry, lemongrass, and cedar are to follow. Cold smoking a batch of 12 salt samples measuring 1 tablespoon each for 24 hours, removing one sample every 2 hours to find the best length of time for smoking without heat. This will hopefully send me in a good direction in terms of time and leaning toward hot or cold smoking. I am adding the with and without steam pan smokings to try to gauge humidity into my results. I intuitively believe that water will effect the absorption and taste of the salt. Salt and water just interact chemically too much for this not to have an effect - I have no idea which will create a better result. The other thing I am going to try is an in smoker evaporative salt forming: boiling a cup of salt into a cup of water, and evaporating it back to salt crystals inside the smoker. This experiment would take too long for me to try it it with different techniques very quickly, so I am going start by tasting the water from the steam pan in my hot smoking experiment decribed above; marking the quality of the taste of the water as time passes, and graph when the water becomes too smoky or bitter. Then I will use the resulting time line to as a starting point for my evaporative salt forming; removing the smoke when the brine has reached the best time suggested by the graph. Read "Experiments Smoking Salt: Part II"